The analysis phase is sometimes refered to as a Front-End Analysis in that while you normally perform some type of analysis throughout the entire ADDIE process, this “front end” of the process is where the main problem identification is performed, such as identifying the problem, analyzing the job and selecting the tasks to train (U.S. Army Field Artillery School, 1984). It includes both a Training Needs Analysis (TNA) and a Needs Assessment. The TNA is performed to see if a learning or training solution will solve a business problem (Tovey, 1997). Managers will often call a performance problem a training problem. Thus, you must ensure that a learning or training solution will fix the problem or if a different performance solution is required. 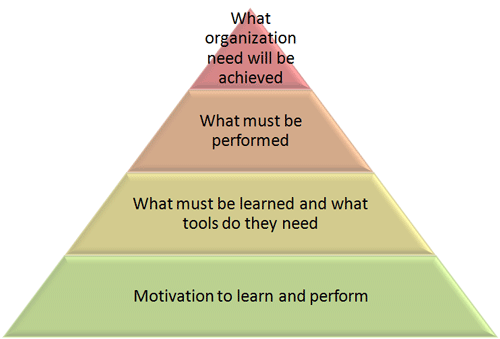 A Needs Assessment is performed to determine and articulate the business unit or customer's learning, training, and performance needs (DeSimone, Werner, 2012). While a TNA is mostly used to find a solution to a known problem, a Needs Assessment is normally used to discover unknown problems or areas that can be improved. Training investments are positively related to stock market performance, with those firms that spend more on training likely to outperform other firms - Laurie Bassi & Daniel McMurrer (2007). When performing an analysis, it is best to use a backwards planning approach, which is also known as backwards design or backwards mapping. This is accomplished by identifying your goal and then determining the actions that will most likely help you to effectively and efficiently arrive at the goal. This allows you to create benchmarks for determining how successful your planning is. Result - What impact (outcome) will improve our business? As the next section shows, you can easily check to see if your solution to the four planning steps is correct. Notice that each effect on a event effects the next one, which has an effect-cause-effect that loops back upon the original event. When you reach the last arrow, the white one, you should have reached the result or impact you were looking for. If not, then you will have to troubleshoot your plan, correct it, and then repeat all or part of the process. The Four Performance Analysis Needs are discussed below. To determine the business need, investigate the problem or performance initiative to see how it supports the mission statement, leader's vision, and/or organizational goals. Fixing a problem or making a process better is just as good as a Return on Investment (ROI), if not better. Organizations that focus strictly on ROI are normally focusing on cost-cutting. And you can only cut costs so much before you start stripping out the core parts of a business. A much better approach is to improve a performance or process that supports a key organization goal, vision, or mission. When senior executives were asked the most important training initiatives, 77% cited, “aligning learning strategies with business goals”; 75% cited, “ensuring learning content meets workforce requirements”; and 72% said, “boosting productivity and agility” (Training Magazine, 2004). Thus, senior leaders are not looking at training to be a profit center (that is what other business units are for), rather they are looking at performance improvement initiatives to help grow the organization so that it can reach its goals and perform its mission. 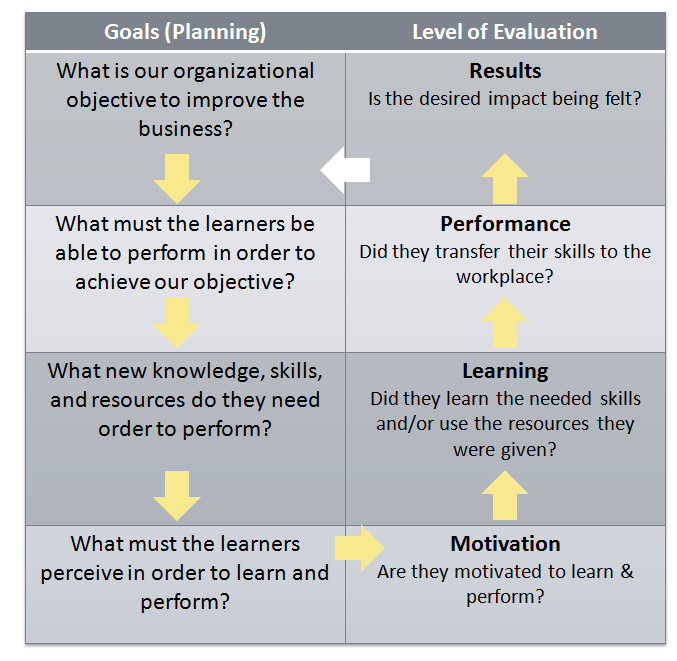 This analysis looks at the job performance needed to solve the business need by asking, “What do the workers need to perform in order to meet the desired business need?” This can best be accomplished by finding the gap between the present performance and the desired future performance and then creating a solution to fix it. This is perhaps the most important need to look at as it links the performer with the organization. When analyzing job performance, you want to look at the entire spectrum that surrounds the job: processes, environment, actual performance verses needed performance, etc, thus, it often helps to divide the analysis into three groups: people, data, and things. If you only look at what they need to learn and then perform, then you might miss obstacles that will impede their performance, such as poor processes or environmental roadblocks. As you assess the performance for any needed interventions, look at the Job/Performer requirements, that is, what does the performer need to know and do to be successful? In addition, look at how you are going to evaluate any learning requirements (level 2). It is one thing to determine the needs of the performers, such as skills, knowledge, and their self-system (attitude, metacognition), but it is quite another thing to ensure that those requirements actually take place. In addition, include performance aids or tools used in place of learning. 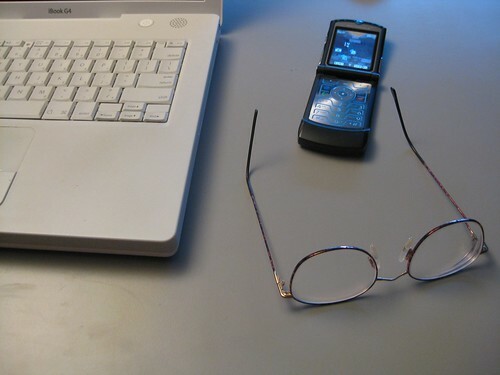 For example, rather than memorizing a list of steps to perform, provide them a checklist, such as paper or electronic. This reduces the amount of time needed for training and helps to speed up the time to actual performance. 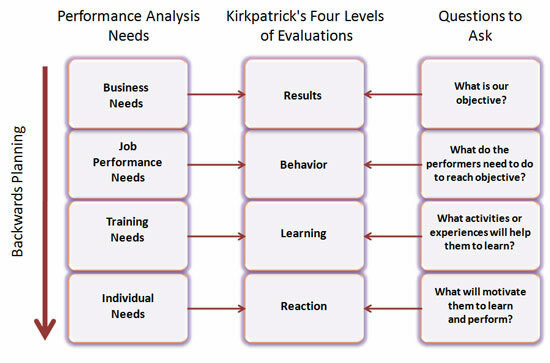 The Individual Needs align with Kirkpatrick's Reaction (see chart 1 above). However, Kirkpatrick's Reaction was mostly concerned with the level of the learner's happiness with the learning program. What this stage really needs is to ensure that the performance intervention (learning process) actually conforms to the individual requirements. For example, in the Training Needs analysis it might be determined that the job holders need to learn a new process. The target population is analyzed to determine the actual content, context, and delivery method of the performance intervention that will best fit their needs. The goal is to ensure that the intended learners see the real worth of the learning program. If you and their managers cannot convince them that they need to learn and perform correctly, then they will probably never learn to perform or once they complete the learning process, they will probably not put their newly learned skills and knowledge to full use. Note that I highlighted “and their managers” as people will most often perform what their managers expect them to do, while forgetting what the managers least emphasize. Bassi, L., McMurrer, D. (2007). Maximizing Your Return on People. Harvard Business Review, March 2007, Reprint R0703H. DeSimone, R.L., Werner, J.M. (2012). Human Resource Development. Mason, Ohio: South-Western College Pub. Phillips, J., Phillips, P. (2002). 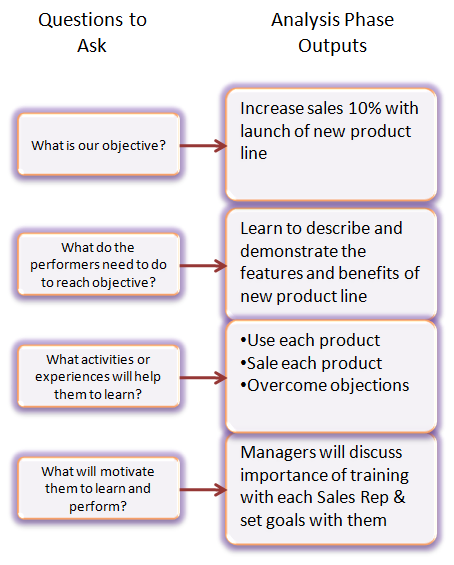 Reasons Why Training & Development Fails... and What You Can Do About It. Training Magazine, September 2002, pp.78-85. U.S. Army Field Artillery School (1984). A System Approach To Training. (Course Student textbook). ST - 5K061FD92. Rossett, A., Sheldon, K. (2001). Beyond the Podium: Delivering Training and Performance to a Digital World. San Francisco: Jossey-Bass/Pfeiffer, p.67. Tovey, M.D. (1997). Training in Australia. Sydney: Prentice Hall of Australia.